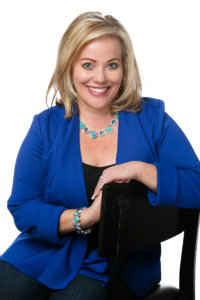 Heather M. Hunter is a naturally gifted evidential psychic medium using her abilities to bridge the gap between the physical world and the world of Spirit. Heather’s passion is to bring forth evidential information and specific healing messages from loved ones in Spirit, validating that they forever remain a part of our lives, just in a different way. 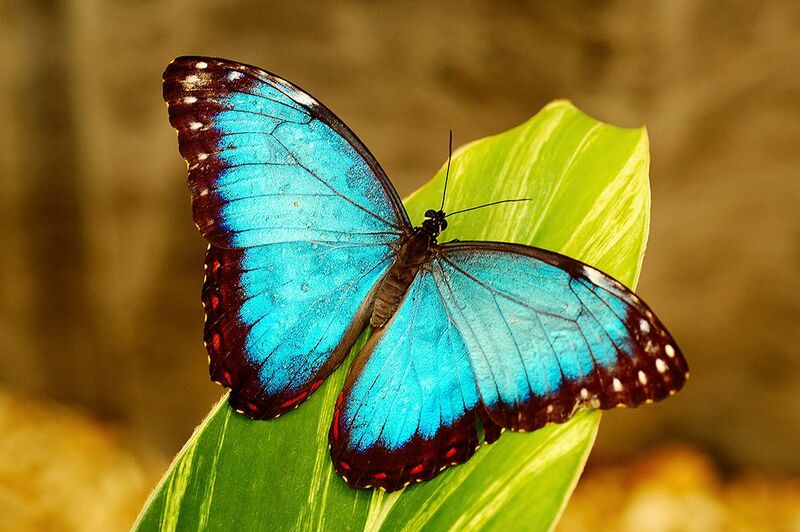 A former therapist, Heather learned that the other side is every bit as eager to connect with us as we are with them, and that just like us, those in spirit often desire to heal emotional wounds and gain closure for their growth and peace on the other side. Heather brings to her readings a high level of compassion and integrity and encourages those in the spirit realm to bring forth what is most needed for the healing and personal growth of their living loved ones, as well as the spirits themselves. She is loved by individuals and audiences for her down-to-earth demeanor and candor, and her ability to lighten the often heavy subject of death with just the right dose of humor. Heather’s readings and events contain stories of joy, humor, forgiveness, growth, and healing from the other side, teaching those of us here what it truly means to live. Graduated High School : Battle Creek, Michigan. Heather worked with emotionally disturbed and developmentally delayed children and adolescents, and received training for and volunteered as a Court-Appointed Special Advocate for foster children. M.A. - Nationally accredited Marriage, Family, and Child Counseling program at the University of San Diego. Internship with Children's Hospital of San Diego. Founded Casa Mariposa/Casa Mariposa Productions: Personal empowerment/development and spiritual awareness events and programs. Casa Mariposa hosted local and national authors, speakers, and spiritual leaders, including Panache Desai (featured on Oprah). As Heather's medical intuitive and psychic gifts exploded open in the early 2000's, she enrolled in programs by nationally renown spiritual speakers and authors such as Carolyn Myss and James Van Praagh. At the urging of her "spirit team" (the term Heather uses to refer to her own guides, passed loved ones, and angels in the spirit world) Heather was encouraged to step back from other's teachings and to discover her own spiritual path while working as a therapist. Certified Reiki Master: Around 2008, Heather began to share powerful medical intuitive insights and reiki healing with her therapy clients. At the urging of her own clients, the focus of her therapy work became increasingly spiritual and metaphysical in nature. After relocating to CO in 2012, Heather's work became increasingly mediumistic in nature, and word of her now specific and powerful connection with passed loved ones spread like wildfire. This was the beginning of her transition to working full time as an Evidential Medium. Heather resides in the mountains outside of Denver, CO, with her husband, daughter, dogs, and 2 geckos. She also has a son who is a young adult residing in AZ. Heather is an avid nature lover and prefers wilderness and rural life over the city/suburbs. Other interests: Reading, learning/research and writing: Heather is working on her first book. Travel anywhere--especially to lakes, rivers, oceans, woods, mountains, and anywhere with or to visit family. Last but NOT least, Heather truly loves meeting and connecting with people from around the world and all walks of life, linking them with the love, healing, and wisdom of The Other Side. 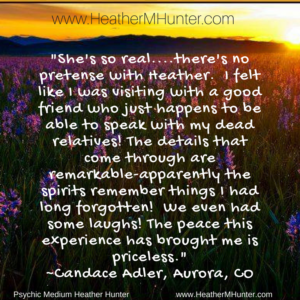 What makes Heather different from other psychic mediums? 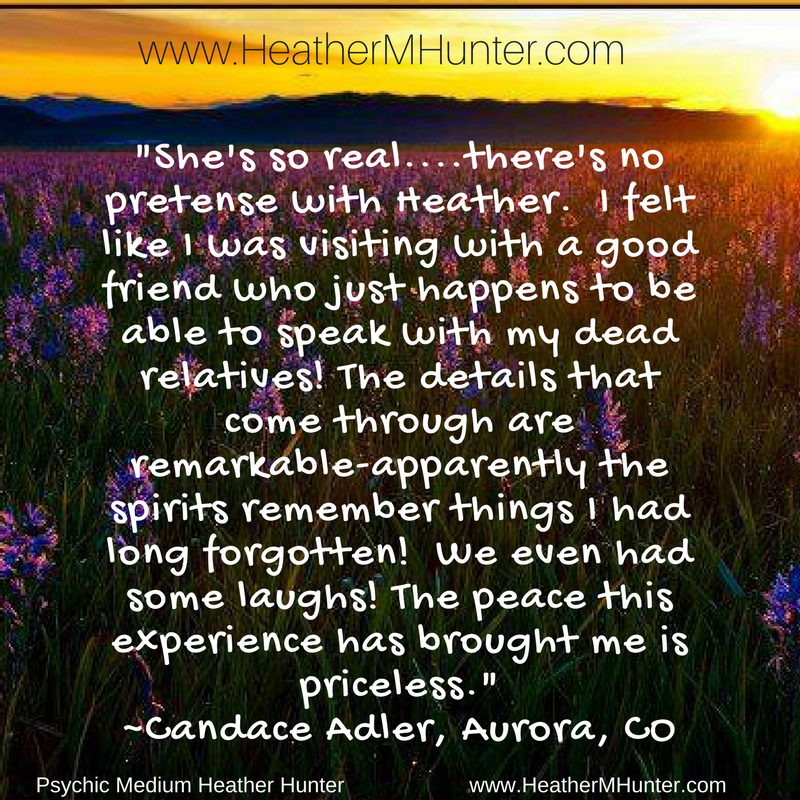 Heather's primary work is connecting with loved ones who have transitioned to the spirit world. This isn't just a part of her work--it is her work. Heather is sought out for the integrity, compassion, and candor she brings to her work as a medium as well as for the quality of her readings. With warmth and a naturally humorous demeanor, Heather lightens up the typically heavy topic of death, and private sessions tend to be very uplifting and healing. A former therapist, Heather understands the fragility of those who are grieving or struggling with their spiritual beliefs, and holds high ethical and moral standards for sharing messages--whether in a large group setting or a private session. She works diligently through her connection with Spirit to share validating details of her spirit person/people so that those receiving the messages are assured through evidential information she is in true contact with their passed loved one(s). Additionally Heather encourages two way communication between those attending a session and the spirits. She truly is the mediator/moderator of feelings and communication between worlds, and encourages her clients to ask questions to their passed loved ones and address "unfinished business." This is a regular part of her sessions, and why Heather is fondly referred to as a "phone line to Heaven". Spirit communication has gained a lot of attention and interest in recent years and a lot of that is because of television programming involving mediums. Consequently, today's mediums are busier than ever. This is a positive development, as more people are letting go of their fears about death and the afterlife and are seeking out the healing they need. Yet unfortunately this has also emboldened practitioners with inconsistent, vague, or unrefined skills to offer mediumship readings on a professional level. This can lead to frustration, confusion and even cynicism for those on the receiving end of unclear messages. Additionally, many mediums today are charging exorbitant fees and are not accessible to a large majority of individuals. Mediumship is a field where fee is not necessarily indicative of skill level. Heather has many repeat clients and referrals to their friends and family, not only because of her skills as a medium, but also because she remains down-to-earth and accessible. Aside from being naturally compassionate and discerning, as a professionally trained therapist, Heather has received extensive training in client-practitioner ethics. Heather achieves an authentic and powerful blending of energy with your spirit person/people. She does not just describe your loved one. Those in the spirit world engage all of Heather's senses, including her feelings, as they visit with you. She becomes so attuned to their essence that in a sense, Heather becomes the spirit person. Heather is extremely gifted at bringing clarity and healing to any unfinished business between you and your spirit person. With a background as a therapist providing what is described as "emotionally-focused" therapy, Heather shares the feelings the spirit world has/had regarding life situations and other topics, as well as their feelings about what family members may be experiencing today.. This is most evident in a private session or a small group experience. Heather is highly clair-audient (clearly hearing) and clairsentient (clearly feeling) in her connection with Spirit. As her connection with your spirit people/person strengthens throughout the session, Heather delivers your loved ones' specific responses to your comments and questions with stunning authenticity often hearing the unique vocal inflections and even word choice/verbal expressions that are typical and unique to your loved one. She may also demonstrate their personal gestures and facial expressions while delivering their messages. She won't "make it fit"
It is rather common that those receiving a reading may try to piece together parts of a message or connection that may not make sense to anyone initially. Heather is meticulous in her discernment of messages and symbols as she holds her connection with Spirit and will not hesitate to say "no, that's not it" when someone offers up a meaning for an image, symbol, or phrase. She will seek further clarification from Spirit. If further clarity isn't forthcoming, she encourages her clients to write down the words or symbols just as they had come through. Often these things become clear to the reading recipient later on. Sometimes it is discovered they were meaningful to another family member who was not present at the session. And of course, there are times when Heather may not feel, hear, or see a clear answer or response to an inquiry for the spirit world. In those cases Heather will always acknowledge that the response is unclear and will never "fill in the blanks". Can I get a psychic reading from Heather? What's the difference between a mediumship session and a psychic reading? It's been said that while not all psychics are mediums, all mediums are psychic. Heather is also an established and credible psychic. Psychics read the energy around a living person or people and can often know past and present events and circumstances, with glimpses into the future (when it's meant to be known). This was a key component of Heather's unique work as a therapist for many years. Heather is able to provide guidance and insight into people, career, relationships, and the like, as part of a private session if this is requested by a client or if she is guided by Spirit to do so. However, your primary reason for having a session with Heather should be to connect with passed loved ones. The term "medium" can come with some confusion. When you are looking for a medium primarily to connect with loved ones in Spirit, Heather suggests you very directly ask the medium if this is work they regularly do, and whether they hold the link with passed loved ones for the entire session. Many psychic mediums have brief contact with passed loved ones, along with guides, angels and psychic insight. They are indeed "mediums" between worlds, so to speak, but the name itself does not guarantee an evidence-filled session with one or more passed loved ones. Ask questions, and let your intuition and feelings guide you in your selection.